It’s rare that one product manages to solve all of your needs or the needs of your customers – no matter how extensive or well designed it is. We all use a plethora of tools to collaborate, communicate and get our work done on a daily basis. Each product used is only one tool of many at our disposal. At Intercom, we believe that tools should be adaptable to your needs and not the other way around. That’s why, today, we are excited to make several announcements for our partners, developers and above all, our customers. First off, we’re launching the publicly available Intercom App Store, already stocked with over 100 apps to help everyone get more done with Intercom. 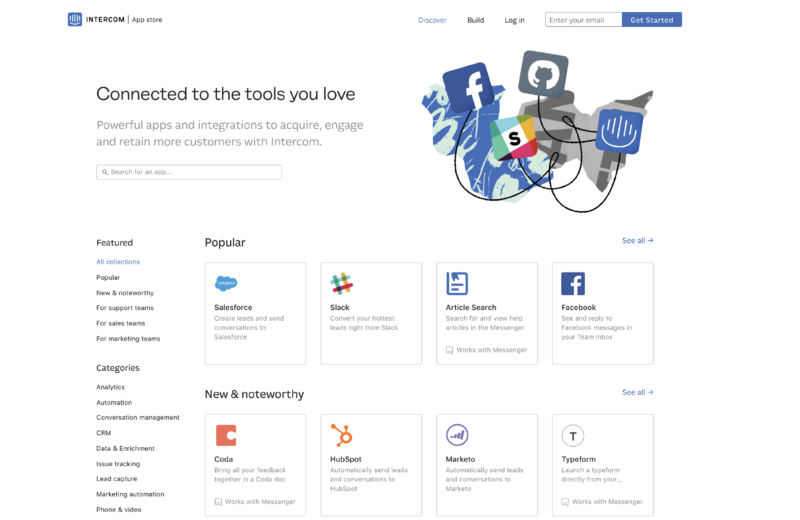 The Intercom App Store is where you can learn about and install apps that make you and your customers more productive and grow more quickly. Until now, our app store has lived behind closed doors within the Intercom product dashboard. From today, we’re opening the app store up to the public. Anyone can now browse and search the full catalogue of apps to discover how Intercom can work seamlessly with the tools they already use. If you’re unsure of how apps could work for you, we’ll be hosting a webinar with Coda on August 21st to share how Intercom apps can speed up your workflows and let you do more in the Messenger. We’re also releasing a significant set of improvements and new capabilities for the Intercom developer platform aimed at empowering our partners and developers to build more rich and powerful apps on top of Intercom, ready to be used by 30,000+ Intercom customers. As we’ve said before, we believe that tools should be adaptable. The new app store and these improved tools represent a significant leap forward for how partners and developers are able to build, test and launch apps – both privately for their own teams and publicly on the Intercom App Store. It’s now simpler and faster than ever to build an app. Whether you’re writing a simple REST API script to import data or building a more sophisticated app destined to function inside our new Messenger, these new developer tools have everything you’ll need to get up and running fast. As well as a simple dashboard for managing your apps, you can now get a free developer workspace to build and test your apps in a safe environment. 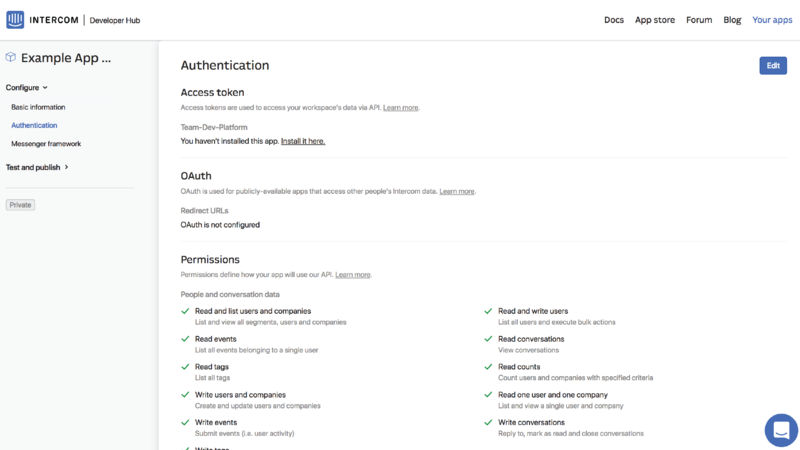 Additionally, we’ve revamped our documentation and guides to help developers who are new to the platform get up and running as quickly as possible. Nearly three months ago we launched the early access for our brand new Messenger Framework that allows you to build apps for the Intercom Messenger – making it the first business messenger with an open platform. Since that announcement, almost 1,000 companies have signed up for the beta and are actively planning and building apps, with dozens already launched on the Intercom App Store. For example, Coda’s newly launched app allows you to proactively solicit feedback and customer feature requests seamlessly right from the Messenger. That feedback then goes straight to a user feedback doc in Coda, so you can analyze and action it – and then send custom responses to the users who requested an update. The net effect is faster shipping with vastly improved customer intelligence and communication. It’s incredibly exciting to feel such early momentum with great partners like Coda, Typeform, Wootric and more than 100 others in the app store. Over the past three months, we’ve been hard at work making many improvements to the Messenger Framework and extending the surfaces where apps can be used, like outbound messages and on mobile. It’s now time for us to let the framework out of beta and into the wild, so anyone can build an app for the Messenger – whether you’re building workflows exclusively for your own team to use or you want to build an app that will be listed in the Intercom App Store. To learn more about building an app for Messenger, check out our docs. We’re looking forward to seeing what you come up with! This is the start of many more changes we have planned to make Intercom more extensible and ultimately more powerful. These new tools and frameworks offer a strong starting point for our customers and partners to customize Intercom to their own use cases and needs and we’ve got so much more coming that we can’t wait to share with you. In the meantime, we would love to hear more from you about what you’re building, what platform features would make the process even easier or any suggestions for apps you want to see. You can join the conversation in our developer forum.